A performance by Jawad Salkhordeh will take place, featuring the traditional Persian percussion instruments, Daf and Tombak. The book launch will also feature Iranian handcrafted snacks from Qazvin, a province in Iran famous for its pastries, poets, carpet patterns, and calligraphy. 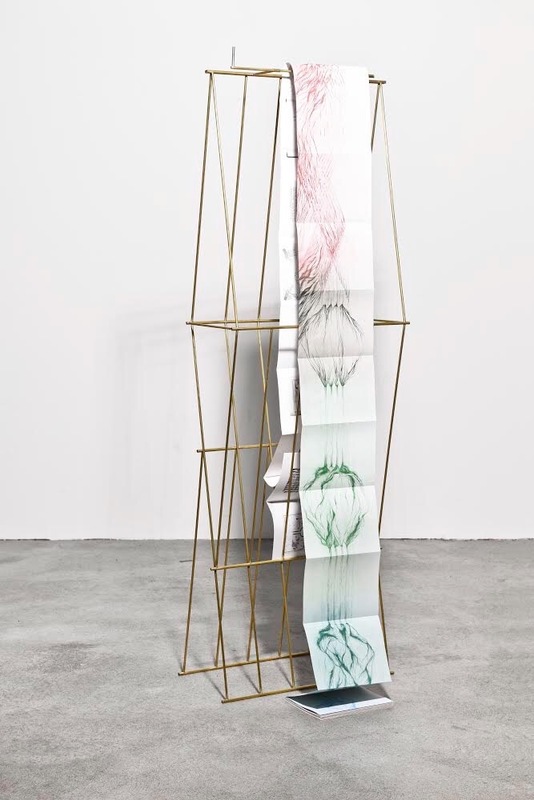 The publication Other Scales of Prosody, in the form of a leporello, captures a singular sixty-meter-long (one-hour) drawing by artist Tanaz Modabber. Conceived with the core idea that the piece would shift form, scale, and tone through multiple stages of translation, the work’s latest transition manifests as this artist-annotated publication with accompanying essay by Cassandra Edlefsen Lasch. Activated by varying means, the scroll-like drawing has been read as a score as well as, in this format, the basis for an expanded referential mapping. Along the length of the published piece a collection of images suggests potential relationships between prosody in poetry, music, architecture, and politics in Iran. The visual composition remains open to interpretation in future texts, sounds, and spatial arrangements. For the first time, the book will be on display together with a brass instrumental structure designed by the artist and available for purchase at Elgarafi BOM DIA.